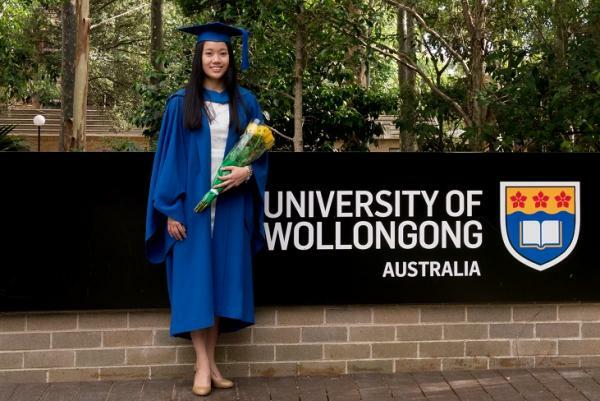 I left Malaysia and Aurora in 2011, with a heavy heart but at the same time I was very excited to pursue a bachelor’s degree in Mathematics and Finance at University of Wollongong in Australia NSW. In my second week of arrival in Australia, I wasn’t feeling so much of homesick but rather “Aurora”sick. Previously, I have spent every day of the week at Aurora training/ assist coaching, and it was a tremendous change for me not having a regular routine. So, I was determined to find a ballet school and attend Classical ballet lessons. Soon after, I found another dance school which offered Ballroom Latin classes. I started taking social Salsa lessons on Thursday nights, and befriended the coaches at the dance school. They were very friendly and invited me to participate in their dance school performances like, at their Christmas party. Furthermore, I volunteered as an usher at the 2011 Australian National Ballroom Championships held in Wollongong, and I had the opportunity to witness some of the finest Australian Ballroom dancers compete. However, as a full time student at University, I couldn’t afford to pay for rent and bills and extra dance lessons. So, I decided to gradually reduce taking dance lessons. This all happened in my first 2 years of Uni while having an amazing time meeting new friends and maintaining my grades. In my last 2 years of Uni, I spent more time at Uni after lectures as I had more assignments and assessments. However, I also took advantage of the gym facilities at Uni and attended Yoga/Pilates classes during my lunch break or in between classes. My training years at Aurora has built a strong foundation for me in terms of being discipline, driven and focused. I’ve worked as a casual waitress at several cafes/restaurants in the past 3 years and recently completed a 2 month internship with Ernst & Young KL, Malaysia. Having had experience in various different roles and industries, my days at Aurora has been most rewarding. For the past year, I have been applying for Graduate roles, as I would like to secure a job upon graduating in December 2014. Even after receiving numerous rejections from job interviews, I did not give up and finally, just after a week after my final paper at Uni, I managed to secure a role that was closely relevant to my degree –Junior Data Analyst role at a media agency. January 2015 will be the start of a new chapter in my life! I found that, I’ve applied “Practice makes Perfect”, in many aspects of my life not just during my dancing days, but also in my studies, especially maths. Also, to my surprise, most of my life experiences that I’ve shared with my interviewers were mostly my experiences at Aurora, which they found very interesting. I am very happy that I gave my best effort in both my dancing and studies while I could, even though I did not end up pursuing a career in dance. However, dancing will always be the best sport/hobby that I have ever picked up. I believe that the physical and emotional endurance required in dancing shapes a strong character within an individual. I hope my experience as a driven student/dancer inspires others at Aurora to pursue their dreams, be it in dance or other areas of interest.